Even though divorce rates for younger couples is on the decline, the rate of divorces in mature marriages is increasing. As a matter of fact, the divorce rate has nearly doubled for couples age 50 and over throughout the past 25 years according to Pew Research and U.S. Census Bureau data. 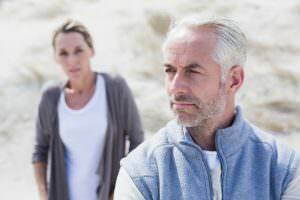 Additionally a study by the American Association of Retired People suggest that two-thirds of the time it is the women in this age category asking for the divorce. By now, you know everything there is to know about one another (or at least you think you do). You’ve had some of the same arguments multiple times (maybe even hundreds of times). The days of passion and excitement have been replaced by consistency and stability (right when we finally have time and energy left at the end of the day to finally feel passion). I Love Him, but I’m Not in Love with Him. This is a common phrase that is used after being together for a long time, but there’s some truth to it. We can have love for someone and genuinely care about their well-being without being in love with them. And the definition of being in love doesn’t have to look like it did when we were young and got butterflies every time we looked in one another’s direction. Being in love is an important aspect of remaining in a happy marriage – not out of obligation, but because there is no one else we would choose to walk beside in this life. We’re Roommates. When we feel like we’re living together as roommates – keeping one another company, but not actively engaged in creating and sustaining the relationship – the marriage is in trouble. Our relationships are like any other living, breathing thing: it needs attention and nurturing in order to grow and thrive. Too often, we place our marriages on auto-pilot assuming it will take care of itself, but then over the years we disconnect from one another and feel like roommates, or worse – strangers. We Want Different Things. Most of us don’t want the same things by the age of 50 that we did when we were 25 years old. And as those dreams and desires change over time, sometimes two people grow into wanting very different things in the second half of their lives than in the first half of their lives together. I had a client who retired from the financial industry and ready for her next adventure, opened a gym, lost 20 pounds and became a personal trainer. Her husband, however, was ready to slow down, move to the country, buy some land and have the grandkids come and visit occasionally while they watched time pass in their rocking chairs on the front porch. Neither is wrong and both of their desires are equally valid, but what each wanted now in this second half of their lives was very different than what the other wanted. The Attraction is Gone. If we stop the conversation about attraction and chemistry at superficial looks, we’re not seeing the entire picture. Looks may have been what interested us in our partners in the beginning, but it is not the glue that holds us together over time. Connection and intimacy are the things that draw us to our partners later in life; connection and intimacy are the benefits of knowing our partners deeply, which can only happen over time. A client I worked with knew her husband was an attractive man; after all, lots of people had told her so. But, she wasn’t attracted or drawn to him at all. It wasn’t about his looks, it was about a lack of closeness, intimacy and chemistry that was no longer there between them. Living Separate Lives. Maybe years ago, we unknowingly began building separate lives from one another in order to divide and conquer with kids, careers, home, family, and other obligations. Out of necessity, we began creating and living separate lives from one another and focused on the kids and what they needed. We stopped doing things together that and now the distance seems insurmountable. Maintaining a healthy, thriving relationship over the course of several decades is not for the faint of heart. We enter into marriage with very little experience, no training and very little tools to help us navigate the relationship when difficulties, disagreements and struggles arise. Almost everyone finds their marriage in a slump occasionally. It’s helpful to understand if have an understanding if that slump is simply a moment in time or if the marriage is in trouble so that you can take the necessary steps before the distance between you becomes too wide to cross.